A guidewire is a thin and flexible tube which is used to guide a catheter in the diseased artery for correct placement. The insertion point for the guidewire and catheter is usually the femoral artery along with brachial artery and coronary arteries. With the increase in demand for minimally invasive procedures, the demand for guidewires is expected to increase in the next few years. Guidewires are manufactured using stainless steel with an elastic coil tip to avoid damage to the blood vessels and are reusable in nature. A number of companies offer a wide range of tip shapes and wire configurations making it possible for healthcare experts to choose the right product according to the application. Lifestyle habits such smoking, obesity and dietary irregularities are major reasons for the growth of cardiovascular disease prevalence in the world. The treatment of cardiovascular disorders includes devices such as guidewires and stents and the demand is directly proportional to the increasing lifestyle diseases. The demand for guidewires is growing in the healthcare industry owing to their biomechanical properties along with rising patient awareness, reduced hospital stay, and faster recovery. This report identifies the global guidewires market size in for the year 2014-2016, and forecast of the same for year 2021. 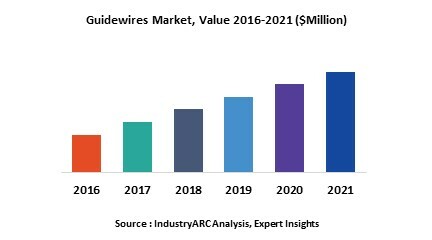 It also highlights the potential growth opportunities in the coming years, while also reviewing the market drivers, restraints, growth indicators, challenges, market dynamics, competitive landscape, and other key aspects with respect to global guidewires market. Geographically North America dominates the global guidewires market owing to rise in geriatric population, and growing incidences of lifestyle diseases. The market in Asia-Pacific is expected to grow at a highest CAGR between 2016 and 2022.